Though most famous as a ski resort, there's also plenty to do at Killington during the summer. 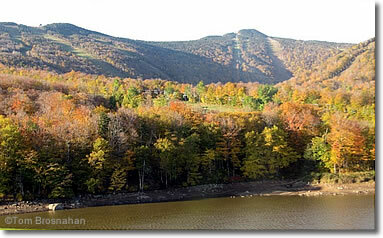 The vast expanse of Killington Mountain Resort is busy in summer with visitors taking scenic ski lift and gondola rides, hiking and mountain biking on the resort's 45 miles (72 km) of trails, swimming and stand-up paddleboarding, tennis, playing the 18-hole golf course and more. Nearby Pico Peak, owned by Killington, has more family-friendly features, including alpine slides, mini golf, disc golf, rock-wall climbing and horseback riding. For those serious about getting into outdoor sports, Killington offers lessons, workshops, classes and training programs for many sports and activities. Everyone coming to the Killington area will want to take the K-1 Gondola Ride to reach the 4,241-foot summit of Mount Killington. They say that this summit was the point from which the territory of "Verd-mont" ("green mountain") was christened in 1763. At the summit you'll find the Peak Lodge, with an observation deck, food and beverage service, and a self-guiding nature trail as well as the start of the mountain's 15 miles (24 km) of marked hiking trails including the Appalachian trail and Vermont's Long Trail. 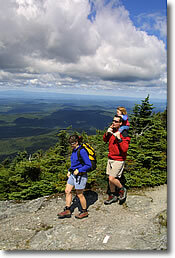 A summer hike at Killington VT.